With summer events fast approaching, now is the time to figure out your looks and establish how you’re going to make a statement with your outfit at any summer soirée. The team here at B Floral has you covered with our fresh floral accessory line for both men and women. They’re the perfect addition to any ensemble and they’re completely customizable - color, texture, design, everything! We can match any type of event, and they’re sure to be the talking point of your look. Last month we held our very own floral accessories press preview to show clients all of the amazing capabilities that B Floral has to offer, not just with our full event design services, but our fresh floral accessory line as well. We had guests come from all different industries. We dazzled attendees from BUSTLE, Guest of a Guest, POPSUGAR, and Resident Magazine, just to name a few! We brought our guests into our office to showcase three new accessory collections. Influencers, editors and bloggers were invited to check out some of our new pieces, and try them on if they felt so inclined! The pieces were unique and buzz worthy, so we were ready to talk about them. Among mimosas and macaroons, we were giddy with excitement over these three remarkable collections. The first collection was an homage to desert fashion where we featured succulents with varying colors and styles. Some of the succulents were even painted gold! We adorned the pieces with gold to add an air of sophistication and poise to elements of a landscape that are usually considered harsh and unforgiving. The second collection brought guests to the Wonderland that Alice so eagerly explored. We utilized all fresh flowers and bright playful colors and elements that we believe Alice probably encountered herself in the mysterious Wonderland. Pinks, purples, yellows, and blues all combined to create a collection of wondrous, mystical filled jewelry and floral accessories. The third collection utilized florals and focused on pink crystals and gold accents. It was feminine and playful, and the guests couldn’t wait to try the pieces on. Varying pinks worked together to create a soft, delicate vibe. 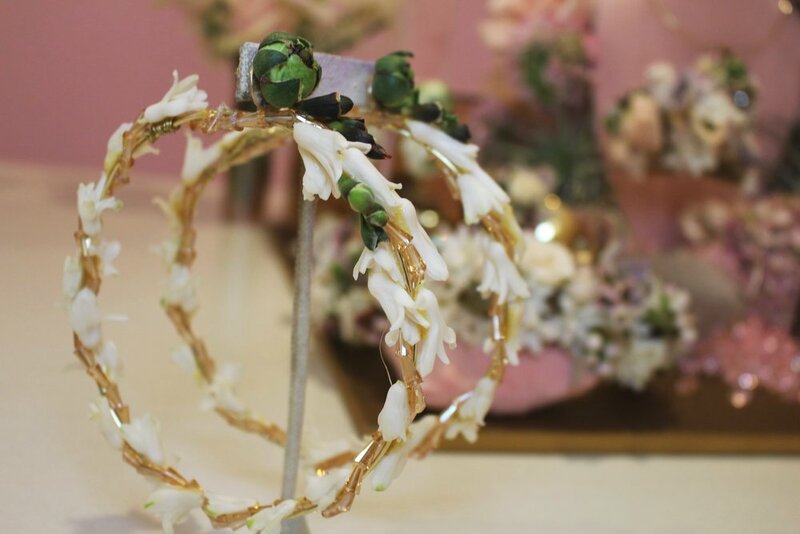 In our unique accessories, we use elements such as fresh flowers, succulents, greenery, and preserved florals to bring these pieces to life. They’re all one of a kind. We can add these live elements to jewelry pieces such as rings, earrings, cuffs, pendants, necklaces, hair barrettes, and headbands. You can go for something fun and playful, or lean towards a more edgy, moody piece. No matter what your design is, you are sure to make a statement with this bold style element. We can provide floral accessories and jewelry for both private and corporate clients. For private clients, we are well adept to creating jewelry for a night out at a gala or a weekend getaway. For corporate clients, we work in the realm of providing floral accessory activation stations at events and more! Contact B Floral at events@bfloral.com to place your order now! Ready to stand out? Brace[let] yourself.